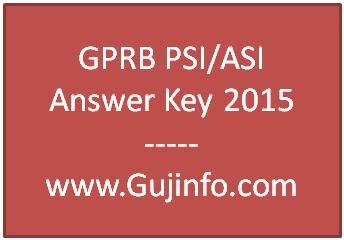 Gujarat Police Recruitment Board has uploaded answer key of PSI / ASI post written examination in form Gujarat Police PSI / ASI Answer Key 2015 on it’s official website www.gprb2015.org. A large number of candidates were present at the examination. All those candidates can download GPRB2015 Answer key form same portal or below link. As you Know Gujarat Police Bharti Board conducted PSI and ASI written exam successfully on 02, 03, and 04 May 2015 at various allotted examination centers across the state. After closed exam they all candidates keep waiting for provisional answer key. The Board has published official answer key on 08 May 2015.Below are the steps to download paper solution through online mode. Download Paper Solution will appear in pdf format. verify your answer with general ones.